As leaders of the G20 nations gather in St. Petersburg for the annual G-20 summit of advanced and emerging market economies, publics in these nations are generally downbeat about their economic futures. 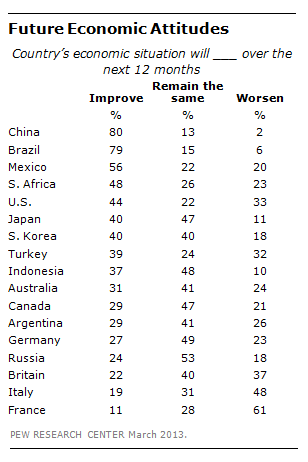 Of the G20 countries, a median of just 37% think their country’s economic situation will improve by spring 2014, according to a survey by the Pew Research Center in March 2013. Moreover, a median of only 39% believe that when children in their societies grow up they will be better off than their parents. While public expectations for the economy remain upbeat in China (80% think things will improve by March, 2014) and Brazil (79%), sentiment in Italy (19%) and France (11%) is decidedly downbeat. And, the long-term perspectives of these countries is not much different. Again the Chinese and the Brazilians are most optimistic about prospects for the next generation and the Italians and the French who are the most negative. Notably, Indonesians, South Koreans, Russians and Argentines are far more hopeful about their children’s futures than they are about the immediate economic prospects for their country. Public sentiment may prove too pessimistic in some of the advanced G20 economies and a bit too optimistic in some of the emerging markets when measured against current economic trends.